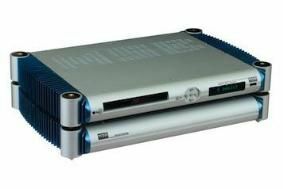 CES 2011: MSB announces Oppo-based Universal Media Transport | What Hi-Fi? The company makes no bones about the fact that the $3995 machine, which offers universal disc playback, network streaming and USB/HDD interface, is based around the drive mechanism of the Oppo BDP-93 Blu-ray player: indeed it says that 'There is just no competition to the core technology of the Oppo. In fact, things are kept so standard that the player even shows the Oppo flash screen when powered up – all part of ensuring easy replacement – and the video section of the player is also retained intact. From there, output is either via S/PDIF, with downsampling to 'the best quality 24 bit signal', to any external DAC, or via the company's full-resolution MSB Network connection, used on its own DACs. These start at $7990 for the DAC IV, and go right up to the $25,995 Diamond Platinum DAC IV. The company says the new transport gives particularly impressive results with SACD, due to its in-house processing, and that a range of power supply options are available further to improve the performance. As standard the UMT comes with an outboard desktop power supply, bringing the price up to $4590: the Signature Power Base illustrated takes the total to $7490, while the top of the range Diamond Power Base adds a further $1000 to the price.